This week has been lot less coding and more of understanding some pieces of codes for next set of changes. As far as the implementation goes, the Tr operations ( including partial trace/reduce density operations) for qubits was implemented. 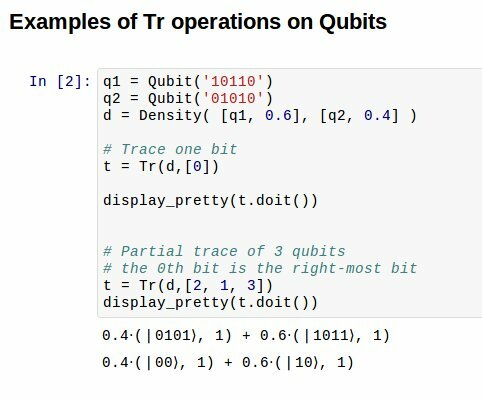 Some examples of the Tr operations on qubits can be seen here. The changes shown above are currently available in my git branch over here. I plan to submit a PR of this branch as soon as the my current PR 1396 is merged. Another task I have been working on this week is figuring changes needed to qapply() to perform the L and R operations of density matrix. I plan to work on this tasks during next week. Address comments on current PR 1396. Submit PR for trace_qubit branch and address any reviews on that. Work on the L and R operations. With these activities, the next major task that would remain is to set up trace operations for Time Dependent states. I will start researching on the current implementation of this code to understand where my changes would have to go. On a side note, we are breaking record temperatures in Chicago this week, and it was tough to keep myself cool without an air-conditioner! Hope other Chicagoan Sympy members are doing just fine by the beach!